Make the most of a windowless bedroom with creative and deliberate decorating. Infusing the room with layers of light and reflective surfaces combats a cave-like feel. You can fool the eye (and mind) into forgetting about what's missing with distracting focal points, or instead simply re-create the look of a window. Circulate and recycle the air in a windowless bedroom to avoid a stuffy, uncomfortable atmosphere. A bedroom with two twin beds in a loft. A modern bedroom interior with layered lighting. Good lighting design in any room is accomplished with layered lighting--and is critical in a room without a source of incoming natural light. For a pleasant ambient glow against the ceiling, install cove lighting under crown molding wall trim. Use wall sconce fixtures to illuminate windowless walls and provide accent lighting. If the fixtures can't be hardwired into the wall, hide unsightly cords with plastic cord covers and paint them the same color as the wall. If the room has adequate ceiling space, consider a chandelier or hanging pendant for a statement focal piece. Recessed lights and track lights are good options for directional overhead lights. Include a pair of bedside table lamps, or for a cutting-edge look, install wall-mounted swing-arm lamps over each nightstand. The reflection of a bedroom in a rectangular mirror. 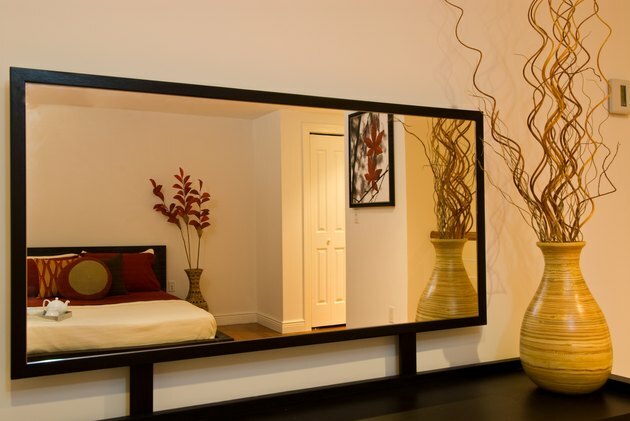 Decorators and designers commonly use mirrors to reflect light throughout a room and create a feeling of spaciousness. A large antique standing floor mirror placed in a corner visually opens up the room and makes an interesting conversation piece. Shiny lacquered bedroom furniture, tables and dressers with mirrored tops and chrome picture frames all help distribute light around the room. Minimalist decorating with sleek, low-profile furniture and a platform-style bed is also conducive to an open feel in the room. Use floating shelves for extra storage and clean, streamlined displays. 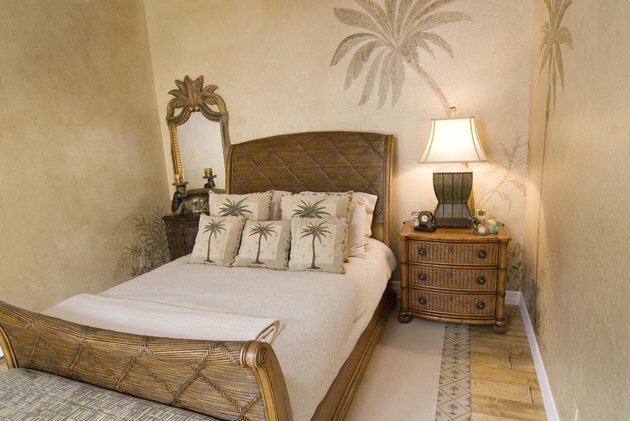 Palm trees painted on the wall in a tropical bedroom. Create the look of a window where there isn't one by mounting a window frame on the wall. Install LED lights inside the frame for a light source and cover the glass with frosted or colored window film. Install a curtain rod over the frame and hang curtains or drapes to soften the room and accessorize the space with pattern and color. Another option is to install a virtual window, which consists of an illuminated light box featuring some type of animated scenic outdoor view. You can also find lifelike wall decals designed to look like windows with outdoor views, or commission a decorative painter to paint a trompe l'oeil of a window with a scenic view. A large wall mural of a forest or beach scene keeps the walls from feeling like they're closing in. A close-up of a ceiling fan hanging from a wooden peak. 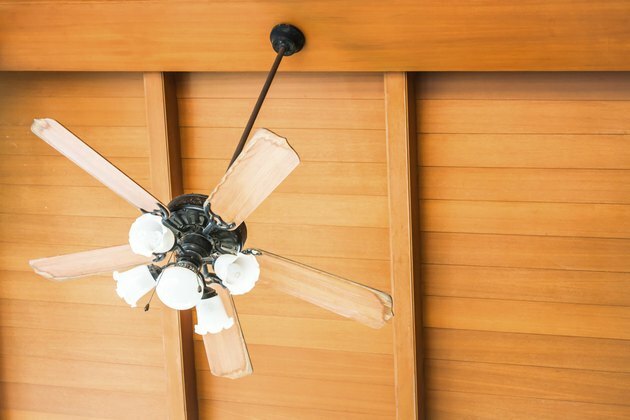 Keep the air flowing in a windowless bedroom by installing a ceiling fan. This helps distribute warm or cool air blowing in through air ducts. Set the blades to rotate counterclockwise during the summer to force air downward for a cooling effect. Reverse the direction to clockwise during the winter to create an updraft, which helps push rising warm air back down. Live houseplants are very beneficial in a room without windows, as they help to actually recycle the air by converting carbon dioxide into oxygen. Plants also bring a sense of the outdoors into the room. According to researcher Kamal Meattle, the three best plants for recycling indoor air are Areca palm, mother-in-law's tongue and the money tree. However, you may need to provide artificial indoor plant lighting to sustain plants without natural light. 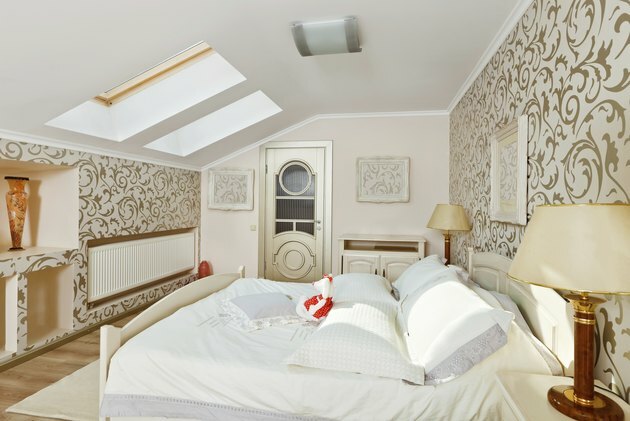 A skylight above a remodeled bedroom in the attic. Paint bedroom walls in light, neutral colors or pale shades of blue or green to create a relaxing, tranquil atmosphere in the room. Paint the ceiling a lighter color than the walls to make it appear higher. Keep the room clean, organized and clutter-free to utilize all available space. Use stone veneer on an accent wall to bring a natural, earthy feeling into the room. 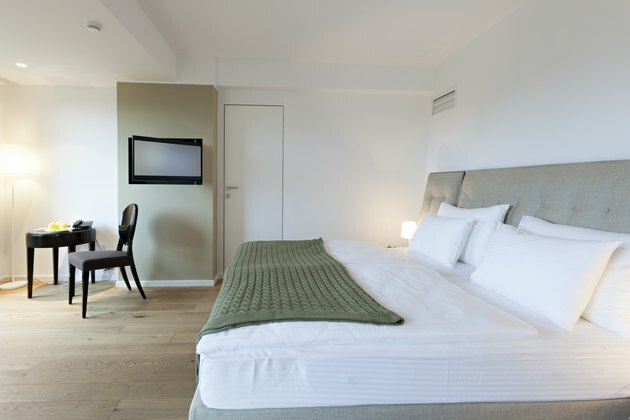 Highlight the wall as a focal point with directional overhead lighting. Whenever possible in loft, attic or second-story bedrooms, install a skylight to help bring natural light into the room. Tubular skylights are easier to install in most cases and can sometimes even reach into first-floor rooms. Is It Better to Have Your Blinds Turned Up or Down?